Our team is a group of Real Estate professionals proudly serving both Minnesota and Wisconsin. We specialize in communities located in the Twin Cities, East Metro and Western Wisconsin. The J. Fletch Real Estate Group creates customer delight by outperforming the industry in ways that sell your home faster, more efficiently and for top dollar. From HWY 94, take Exit 250 (Radio Dr / Inwood Ave N) to the North. 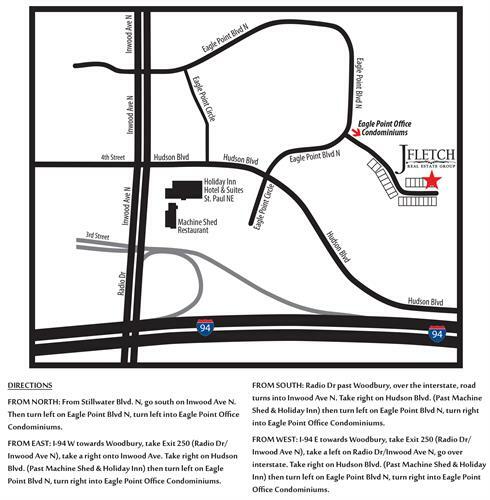 Take a Right on Hudson Blvd and your second left onto Eagle Point Blvd N. Turn Right into Eagle Point Office Condominiums.